PHOENIX – A bill that would allow more first responders use an antidote to combat opiate overdoses won approval Thursday by a House committee. HB 2489, authored by Rep. Heather Carter, R-Cave Creek, would allow first responders such as peace officers and basic-level emergency medical technicians to carry and administer naloxone hydrochloride and other opiate antidotes. Naloxone hydrochloride, better known by the brand name Narcan, works by blocking an opiate’s absorption into cells. For those who overdose on heroin or opiate-based painkillers, the drug puts them into immediate withdrawal and can save their lives. Carter said the bill would help put Arizona more in line with neighboring states like California, New Mexico and Colorado in terms of laws governing the drug’s use. “I’m excited to be part of the solution to some of the public health issues we have related to substance abuse and overdose,” she said. The House Committee on Military Affairs and Public Safety advanced the bill with one dissenting vote, forwarding it to the House floor by way of the Rules Committee. Rep. Mark Finchem, R-Oro Valley, who voted for the bill, said he saw the drug’s lifesaving potential firsthand while working as a fire paramedic. “There were fewer lifesaving awards issued because so many lives were saved (with the drug),” he said. Rep. Eddie Farnsworth, R-Gilbert, who voted against the bill, took issue with a provision that would grant immunity from professional or criminal liability for physicians who issue standing orders for first responders, EMTs and peace officers except in cases of wanton or willful neglect. “I have a longstanding opposition to immunity clauses,” he said while explaining his vote. The committee also passed an amendment proposed by committee chairman Rep. Sonny Borrelli, R-Lake Havasu City, that added nurse practitioners to the list of those allowed to administer the drug. Tim Hill, executive vice president of the Phoenix Firefighters Association, said that while he supports the bill overall he’s concerned about its wording. Carter said she included other opiate antagonists in the bill because she didn’t want to prevent other useful drugs from being used in the future. However, she said that she would be willing to work with lawmakers and stakeholders to improve the bill’s wording. “We always work a delicate balance when we’re drafting legislation of not being too prescriptive in statute while still allowing for some flexibility for new developments in this space,” she said. Michelle Hamby, whose 24-year-old daughter Breana died in 2013 from a heroin overdose, said she believes Arizona needs a law like this to prevent more deaths. Hamby said her daughter used prescription drugs and heroin for six years before her death. She said she felt helpless when she found her daughter unconscious in her room. “I feel that even I should be able to have naloxone if I’ve got a child at risk for an overdose,” she said. Carter said the state should continue to look for ways to improve access to opiate antagonists and that the bill was the first step in addressing this issue. “I personally would be in support of broadening the number of people who could use this medication, but the legislative process has to work its course,” she said. 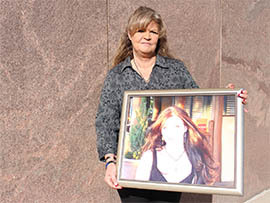 Michelle Hamby, whose 24-year-old daughter Breana died in 2013 from a heroin overdose, brought her picture to a hearing at which a legislative committee advanced a bill to expand the number of first responders able to administer an antidote to overdoses of opiates.